2012 Topps Star Wars Galaxy 7 sees the return of the popular brand that revolves around art connected to the legendary saga. The original Star Wars Galaxy run lasted three series. They remain among the best Star Wars cards ever made. A couple of years ago, Topps resurrected the brand, thanks in part to the rise in popularity of sketch cards. 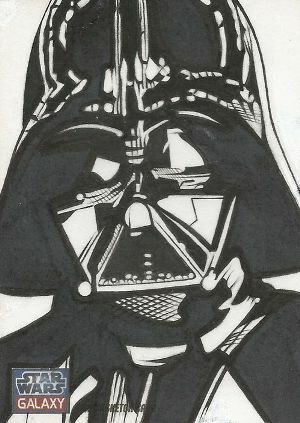 2012 Topps Star Wars Galaxy 7 follows a similar format as in years past, celebrating the entire Star Wars universe through artwork. Every box guarantees a sketch card. Sketch-agraph cards return in Star Wars Galaxy 7, combining original sketch art with autographs from original cast members. 120-card base set with production art, paintings, posters and comic covers. Subsets include "New Visions" with new art from comic artists, "The Art of Dave Dorman," and "Star Wars Celebration." Sketch Cards fall one per box. Sketch-agraph Cards mix original sketch art with autographs from original cast members. Inserts include Foil Cards (1:6) with artwork from Mark McHaley and Etched Foil Puzzle Cards (1:6) from Joe Corroney. Foil cards have three levels of parallels. The original art used for the Etched Foil cards will also make their way into packs. 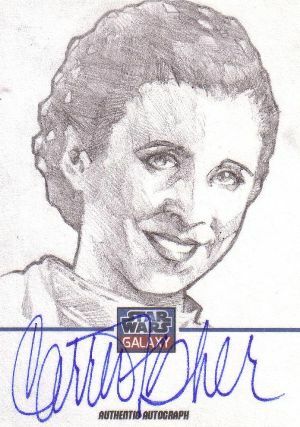 Topps Star Wars Galaxy 7 Sketch Card (Young Anakin) by DON PEDICINI JR.
Star Wars Galaxy series 7 HOBBY Box Auto Sketch MARK HAMILL,CARRIE FISHER ?? Star Wars Galaxy series 7 sealed Case 8 HOBBY box MARK HAMILL,CARRIE FISHER ? ?